June 2013: This is a restaurant that serves Shanghai food that I’ve visited every so often over the past several years. I don’t remember when was the first time I stepped into this restaurant as it was many years ago, but because of the really good food that they serve here, I’ve been coming back again and again every time I feel like having some of my favourite Shanghainese dishes. 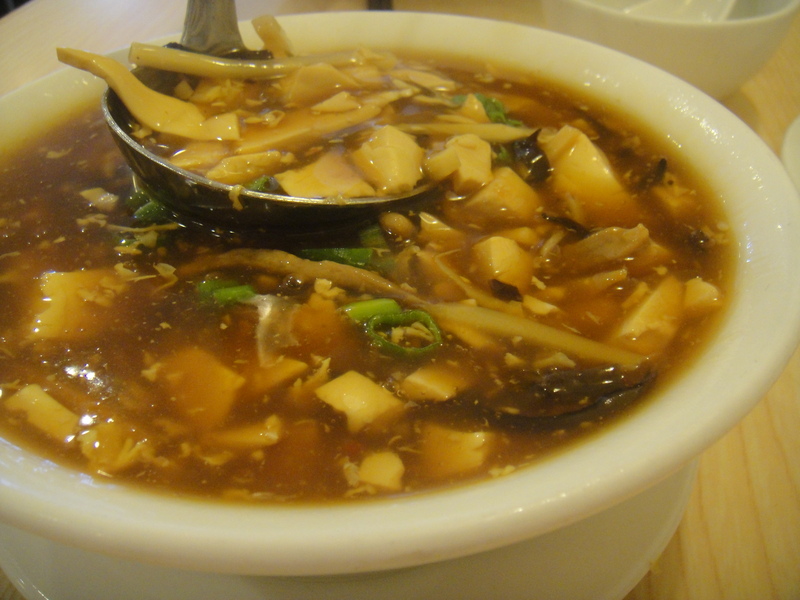 Hot and sour soup: Sometimes we get the one that has the wontons in it too. I remember the first time that I ate it, it was too spicy and I could only take one sip. I had to remove the wontons from the spicy soup and to cool them off first before eating it too. Now, I think I’ve gotten so used to their level of spice that I can just eat it without flinching. That or they have lowered their spice level. It has tofu, Chinese fungus, green onions, and pork. 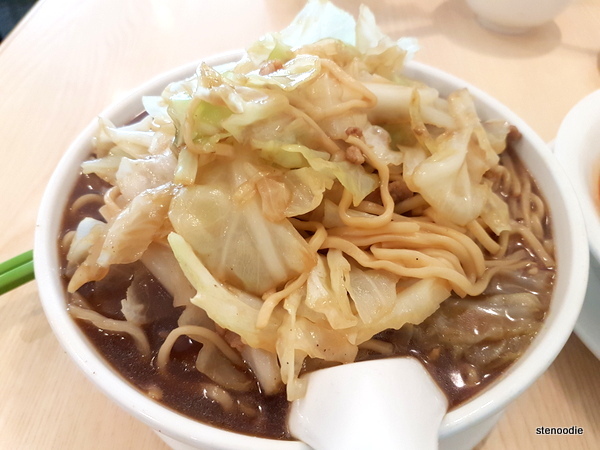 This “dai low” noodle is something that we almost always order. It’s a noodle in a clear, thick soup base and has mushrooms, chicken, snap peas, pork belly, shrimp, and some type of stalk vegetable. It’s bland on the most part but not inedible. I like how it’s really simple and not chock full of flavour. I also like how the mushrooms are always very smooth and soft. This next dish is one of my absolute favourite things to order from this restaurant! I don’t know what the proper name is for this dish, but it’s basically a pastry topped with sesame seeds where you spoon in steaming hot pan fried pork bits and vegetable. I love it because the pork bits are so well flavoured and when you spoon it into the pastry (they provide you with a miniature spoon to do this), it creates a little bun-like thing that you hold and munch into. The pastry is best when it’s hot and crispy too. I’m usually feeling for this dish when I’m craving for something salty and savory. Here you can see the plate of meat and the plate of four pastry “pockets”. 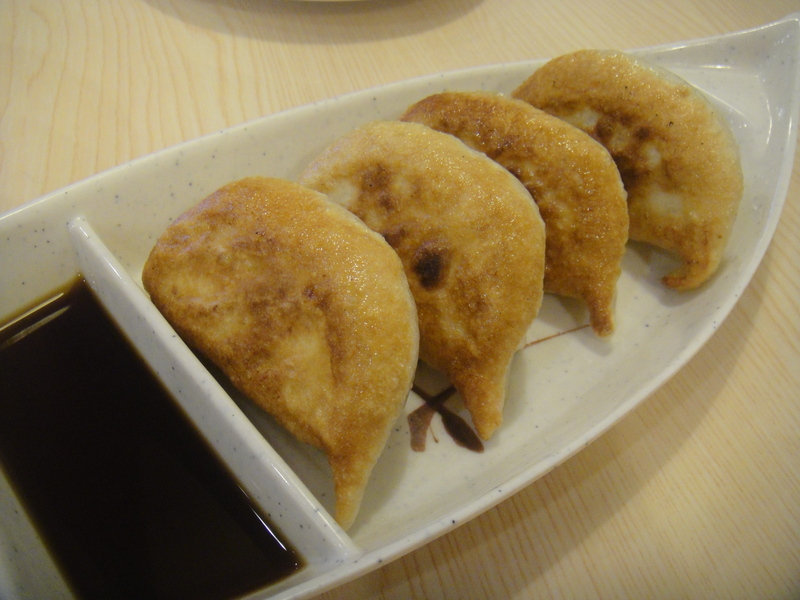 Last but not least, this time, we ventured out of what we usually order and got the pan fried pork dumplings. They were pretty good as well. There is another dish at this restaurant that I used to love. 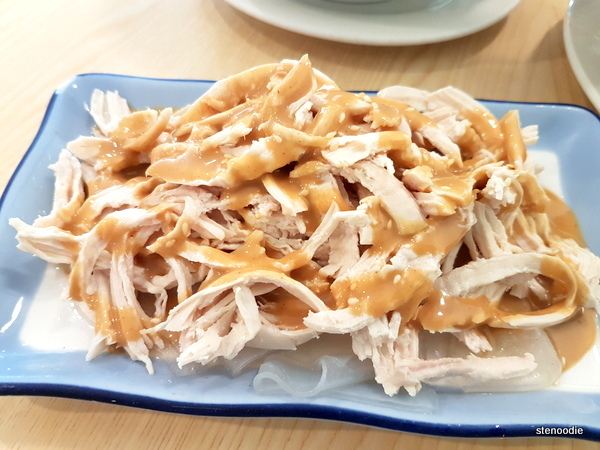 It’s peanut covered hand-shred chicken strips with wide, clear noodles. It’s served chilled and I can demolish the whole thing within seconds when it arrives on the table. It’s really good if you like peanut better chilled with meat. I don’t have a picture of it though, unfortunately. July 10, 2018: I returned to my favourite Shanghainese restaurant after who knows how long. I love that the restaurant hasn’t changed and the female owner is still there serving the guests. It was also still busy when we arrived on a Tuesday around 6 p.m.
We ordered the family combo set (oops, I didn’t even take a photo of the menu page) but this was a really, really good deal for $25! 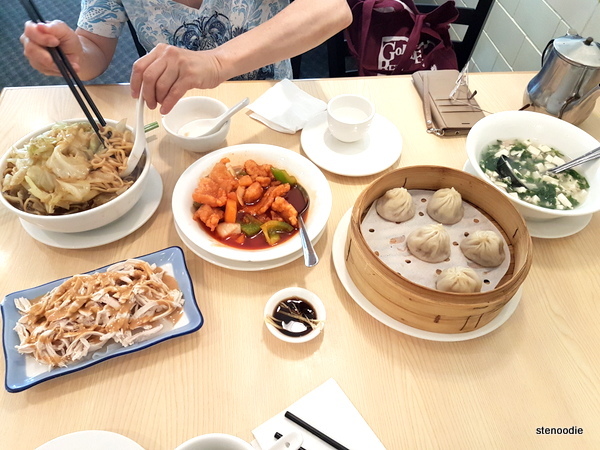 It’s meant for two people and includes a soup, dumplings, and a choice of two items. 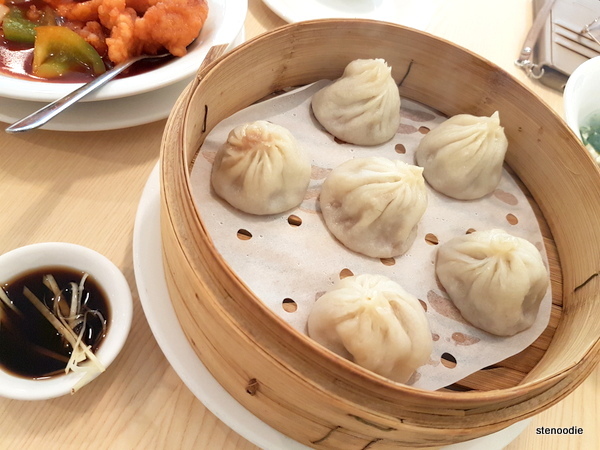 The soup is a choice of hot and sour soup or a tofu soup; the dumplings are Shanghai steamed (xiao long bao) dumplings or pan-fried dumplings or “san zeen bao”; and the dishes are various Shanghainese dishes off their regular menu. 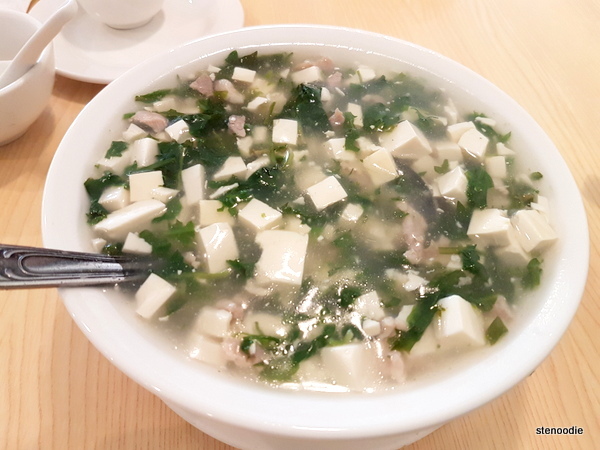 The Pork & Chinese Cress with Bean Curd Soup was really good! It was perfect comfort soup. It was so smooth and with the smoothest tofu chunks. The xiao long bao (“Steam Bun Filled Pork“) were good and juicy. 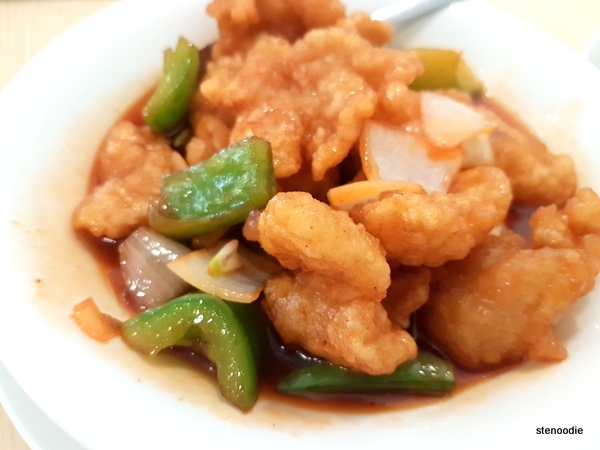 We chose the Shanghai Noodle in Soup (with modified thin noodles instead of the thick noodles) and also the Fish Fillet with Sweet & Sour Sauce. The noodles had lots of cabbage piled on top of it and pork bits. I’m so glad this restaurant is still doing well! This entry was posted in Food and tagged 7750 Kennedy Rd, Fish Fillet with Sweet & Sour Sauce, food blog, foodie, Golden Shanghai Restaurant, Golden Shanghai Restaurant food reviews, hot and sour soup, Kennedy, lunch, Markham, pan fried pork dumplings, Peanut butter sauce on top of shredded chicken and transparent noodles, Pork & Chinese Cress with Bean Curd Soup, restaurant review, Shanghai food, Shanghai Noodle in Soup, Shanghai restaurant in Markham, Shanghainese, Shanghainese restaurants in Markham, Shredded Chicken with Starch Sheet, Steam Bun Filled Pork, Toronto food blogger. Bookmark the permalink.